← XBOX ONE – Is the 2013 Golden Poo award coming soon !?! 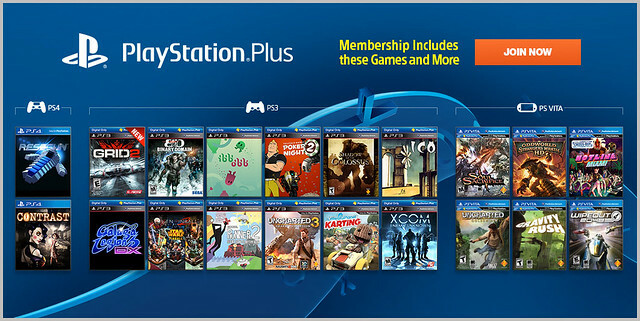 PS Plus: GRID 2 Free for PS Plus Members ! Hop in to the driver’s seat with GRID 2 on PS3, coming to you free for PS Plus members to kick off the month of December. In addition to GRID 2, you’ll also note the start of the PlayStation Store Holiday Sale! The first week brings in some of this year’s best titles including Ni No Kuni, Remember Me, and Terraria; all at really really good prices. You can take advantage of all these PS Plus benefits after the PlayStation Store updates tomorrow, 12/3. Be fast, be first and be famous as you join the elite in ‘World Series Racing’ where the greatest cars, drivers and events come together in the search for a new motorsport icon. Experience aggressive racing against advanced AI and become immersed in the race with GRID 2’s new TrueFeel™ Handling system which powers edge-of-control exhilaration behind the wheel of every iconic car. An extensive, separate online campaign powered by RaceNet sets new standards in the genre. Welcome back to racing. It’s week 1 of the PlayStation Store Holiday Sale! Check out these slammin’ sales on some of gaming’s best and check back over the next few weeks to see what else is on deck for a hefty PS Plus discount. In addition to the PlayStation Store Holiday Sale, have a look at these additional discounts including the wonderful Rainbow Moon on PS Vita. What’s your favorite content from this week’s update? We’ll be back next week to add another title to the Instant Game Collection as well as more discounts, Holiday Sale Week 2 info, and more. If you’ve got feedback on today’s Plus update make sure vote in the poll and leave a comment below. To discuss all things PlayStation, including this update, you can also head over to the PlayStation Community Forums where you’ll find topics you can contribute your thoughts to, or start one for yourself.